By the time Leland T. Blank, Ph.D. (B.S. 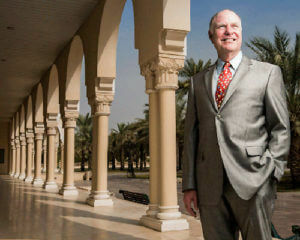 ’67), stepped down in 2005 as Dean of American University of Sharjah (AUS) College of Engineering, he had helped shape the fledgling engineering school into one of the premier institutions in the United Arab Emirates. The school had earned ABET accreditation – an important milestone in marking a school’s academic excellence — and grown to 1,000 students strong. Blank returned to his home in Austin, was awarded the title of Dean Emeritus and felt as if his work was done. Last March, Blank, along with his wife, Sallie V. Shepherd, Ph.D., returned to the Middle East so he could reassume the responsibilities of dean following the departure of his successor. While the job is the same, it’s a very different engineering school from the one Blank left eight years ago — new department heads are there, the student body has tripled, six graduate programs have been established and a brand new lab facility is under construction. During his first term as dean, he successfully built a multinational faculty by enforcing team building and joint decision-making. And Blank doesn’t believe in changing a formula that works. Both Blank and Shepherd have dedicated their careers to advancing higher education. The pair spent a combined 40 years on the faculty of the College of Engineering at Texas A&M University. When Blank originally accepted the Dean of Engineering position in 2001 for the newly established AUS, Shepherd also was offered a position as vice chancellor. “I had to report to her both at home as her husband and at work as her dean,” he quipped. This time around, Shepherd is contributing on a part-time basis as a consultant to the provost. Blank, however, has committed to his position until the summer of 2015. At age 69, Blank could be enjoying retirement, but seeing higher education flourish in other parts of the world is something he enjoys more.